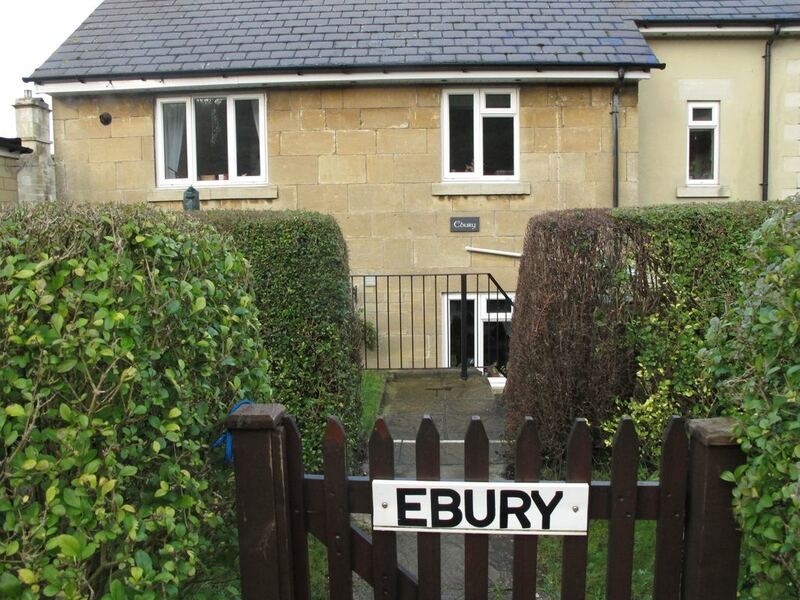 The present Ebury Cottage, which I own, was built in 1936 out of alignment with other houses in the row. It was constructed by Edward George Barnett, builder, for his own occupation on the plot of land of an earlier house also called Ebury. The photo above was taken before 1936 when Ebury was rebuilt. The first mention of the development of the area is in 1832 when Mr Gale put up four plots for sale near the great Turnpike Road leading from Bath to London. The lots comprised three cottages and a quarry. The tenants of each cottage were Robert Newman, the widow Wiltshire and Robert Shell, all properties held on a 999 year lease granted in 1737. So we know that these cottages had Georgian origins. The 2 acre quarry was leased by Thomas Strong from the lord of the manor of Lullington, Somerset, near Frome. The lord of the manor was probably William Duckworth who owned over 2,000 acres in Somerset, much bought from the Marquess of Bath in 1820. On the 1840 tithe map the land was marked as reference 394 owned by Thomas Strong and described as arable, rough piece between roads. 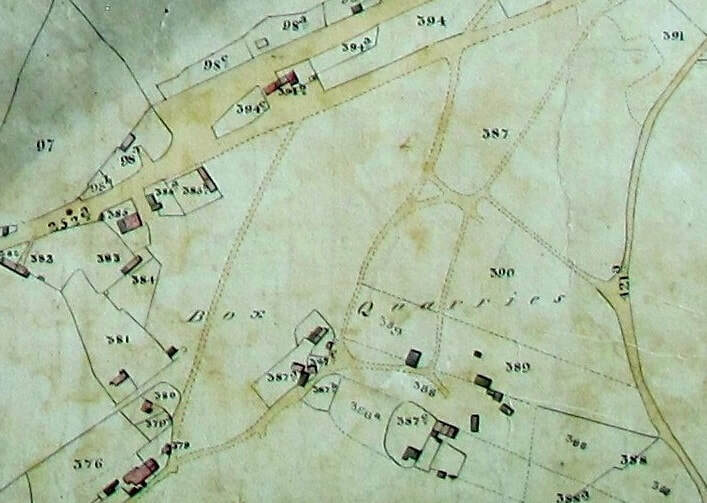 Enclosed out of the land was 394a small garden also owned by Thomas Strong, then properties owned James Pillinger 394b with houses cottage, shop and garden, which appears to have straddled the Drum footpath to the turnpike road, including the property now called Alma. five years later Robert died, aged only 36, with three infant children. The newspaper reported his death after a short but painful illness and he was greatly respected. Robert's wife Eliza Ursula put the whole of her Wiltshire estate up for sale in 1860. This included three lots of land each with three stone and tiled cottages on the top of Box Hill. It also offered for sale several building plots opposite the Rising Sun pub, the origin of the infill development of this part of Box Hill by the Road. Another family member also called Robert (b 1819 in Berkshire, d 1887) took over the quarry company. By 1881 he had married Mary A (b 1824) and they lived at Box Quarries where this Robert called himself quarry master. By 1889 George James Shell (1861 - 1932) and his wife, Elizabeth, lived at Ebury Cottage. For a long time George had lived at 3 Wharf Cottages with his father, John (1829 - 1902), a master mason employing 7 men and 5 boys, and his mother Ann from Berkshire. John was manager of the Box Stone Wharf owned by Pictor & Sons. George James was a distinguished local mason, parish councillor, important member of the Plymouth Brethren at Quarry Hill and of the Box Lodge of Oddfellows. He took over some of his father's firm, describing himself as foreman of stone masons in 1901. George and his wife Elizabeth Archard were reasonably well-off, employing Maud Dancey as a children's maid in 1891. They were aspiring too and didn't stay long at Ebury, moving to 1 Kingston Villas, Bath Road, by 1911. However, none of the properties mentioned above were the modern cottage of Ebury. Edward George Brenton Barnett demolished the old house and put up a new one, not on the exact footprint of the original house but set back from the A4 road with a substantial front garden (compare the modern house right with the photo at heading). The Barnett family were long-standing Box Hill residents. An ancestor of Edward, Thomas Barnett, had been a blacksmith who lived and worked at The Quarries. Edward's grandfather William lived at Tynings Cottages and his father Fred lived at Tisbuts Cottages. Edward George Barnett, was a native of Box, the eldest son of Wilfred Loftus Barnett and his wife Harriett Louisa. Edward George was a mason by trade but it was a time when the quarries were in steep decline. Edward and his wife Elizabeth lived at Vale View, Longsplatt in 1939, where he worked in the War Department Constabulary at the Central Ammunitions Depot based in the underground tunnels. Possibly he was rebuilding Ebury in his spare time and the house was not yet completed. After the war he took employment at Westinghouse, Chippenham, but suffered several years of poor health, dying aged only 45. Ebury, more or less as it is today, was sold to the Clymo family, and I bought it from Mrs Emily Clymo in June 1983. Frank JR (b 1883), mason's apprentice; Wilfred Loftus (b 1887), mason's apprentice; Frederick Neville (b 1889); Elsie (b 1894); Doris (b 1898); Victor (b 1902); and Harry (b 1905). Edward George Brenton Barnett (14 June 1910 - 1955) married Florence E Lucas (b 1934).